Touch (Le Toucher) VII tapestry shows the sense of Touch. Here in this scene, we see the lady touching the horn of the unicorn, beside the flag pole flying the Le Viste flag. Jean Le Viste was thought to be the person who commissioned the Lady and the Unicorn tapestries series from Flanders. Le Viste was a nobleman in the court of King Charles VII. Here the lady with her maid servant is seen in the beautiful mille fleur background of forest animals, flowers and trees. 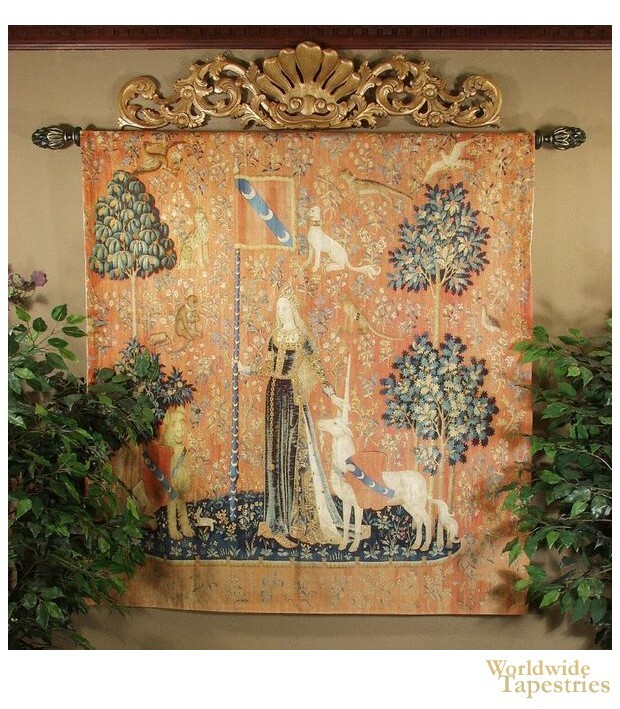 This Lady & Unicorn tapestry, Touch (Le Toucher) VII, is backed with a lining and has a tunnel for easy hanging. Note: tapestry rod and accessories, where pictured, are not included in the price.